Are early adopters starting to act like laggards? It may seem a paradox that the most forward-thinking consumers – the first to adopt smartphones – would also be the ones more strongly avoiding unique smartphone features. The true answer is that consumers are more complex and intelligent than simplistic adoption curve analysis suggests. In choosing mobile phones, they are navigating between the sirens and rocks of enticing deals, identity theft, entertainment, carrier signal strength (or weakness), desire for social connections, misinformation, privacy, trust, and much more. When it comes to data security & privacy, most Smartphone users express concern and corresponding action. A higher share of Smartphone than Basic Mobile Phone users take steps to protect their security and privacy, including disabling some features. Location services have been integral to Smartphones and Feature Phones for years and most handsets give subscribers the option to minimize tracking. However, recent widely publicized breaches have brought this closer to the forefront of consumer’s buying behavior. Age and gender alone do not truly define the privacy-aware from others; correcting for age shows that tech experience matters. Most Smartphone users today have more tech experience than average users, so are savvy about settings and controls and have privacy and security concerns for PCs which are inherited by their Smartphones. App developers which assume settings will be on by default, such as location identification, will encounter market resistance. Privacy and Security are issues which can suddenly inflame public sentiment. Even though customers may have read agreements and adjusted their privacy & security settings, many have an expectation of being private and secure. Consumers vote with their responses, as well as their fingers and wallets. Building (or rebuilding) trust is a widespread issue, and certainly not only in the U.S. Each participant in the ecosystem of handling personally identifiable information has their part to play if location-based services and mobile payments are to flourish and last longer than fads. MetaFacts expects that privacy and security will continue to stay a concern among many consumers with reported breaches beyond those specifically on Smartphones – from identify theft to Wikileaks reports. Each mobile PC brand has attracted a different set of customers, not only in their socio-demographics, but also in their technology-related attitudes. While most mobile PC users hold similar attitudes, in several areas there are notable differences. The last few years have seen a strong emergence in green marketing. When it comes to the disposal of previous computers, it’s interesting and surprising that HP has the poorest showing. Nearly four out of nine (45%) say it is difficult to find a place to dispose of a home PC, the highest rate of all mobile PC brand users. This is despite HP’s many various publicized efforts to streamline green disposal, especially with printer consumables. Apparently, there is not much of a halo effect between HP’s ubiquitous cartridge recycling self-mailers and its PCs. The extent of refined choice is evident in the differences between how mobile PC users prefer to have the best-of-breed “BOB” versus buying a simple or convenient bundle. 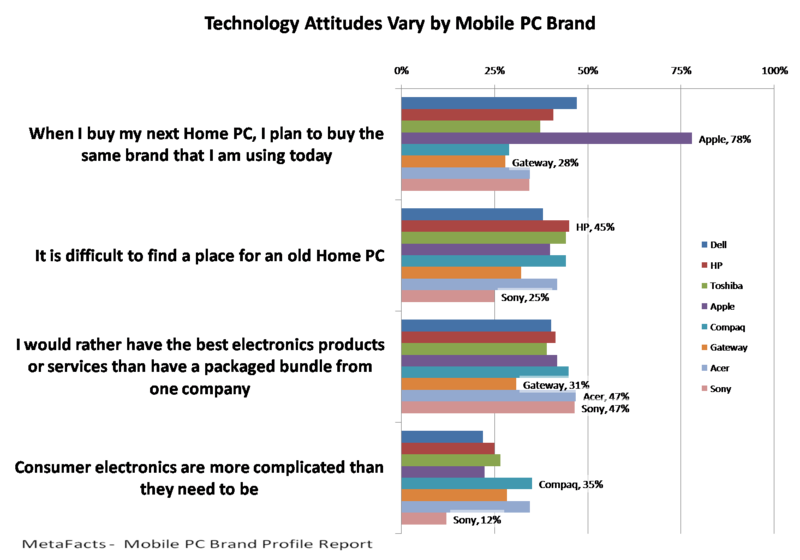 Sony mobile PC users have the strongest interest in getting the best electronics products or services instead of a product/service bundle, with nearly half (47%) strongly agreeing. By comparison, less than a third (31%) of Gateway users similarly agree. Sony mobile PC users are also distinctive in their comfort with technology. They have the lowest agreement that technology products are too complicated, with only 12% strongly agreeing, while more than a third (35%) of Compaq mobile PC users confess to being overwhelmed.